2019 marks Faith in Public Life’s second year in Florida. Because of faith leaders like you, we’ve met discrimination, gun violence and voter suppression with bold moral leadership. Thank you for harnessing your faith to advance on the path for equality, justice and civic engagement in Florida. This year, we can intensify our efforts to forge a fair, equitable, inclusive Florida for everyone. I want to invite you to become a Movement Builder Congregation to build on your work and invest in clergy leadership development throughout our state! As we enter a new year, I wanted to share with you the five things I’m most proud of from 2018. 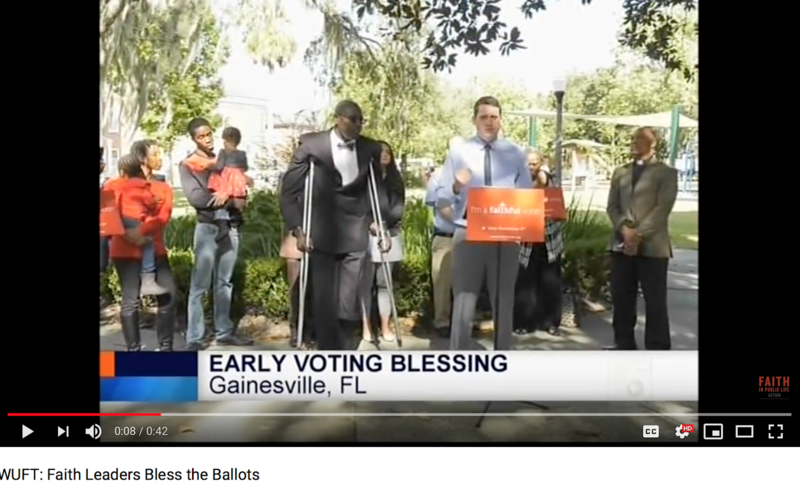 In our Faithful Voter program, we worked with faith leaders to bring “Souls to the Polls” and educate voters on Amendment 4, which restored voting rights to 1.5 million returning citizens. We asked congregations topledge to be “Faithful Voters” and saw historic increases in turnout in our congregations’ communities. 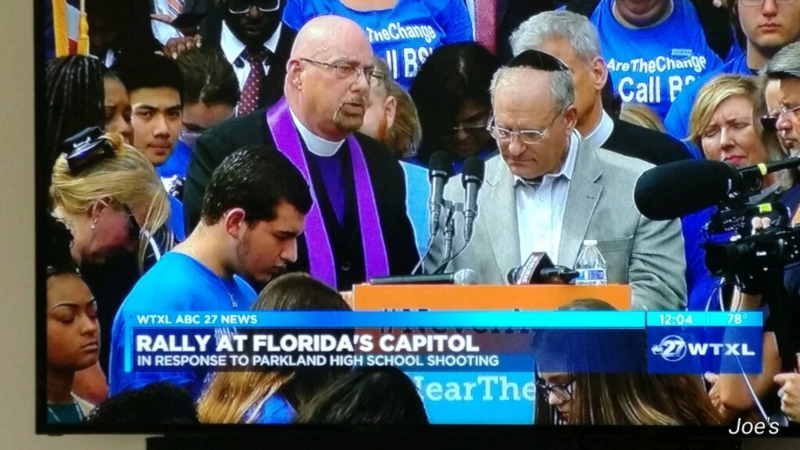 Over 100 faith leaders from Duval, Alachua and St. Johns Counties joined the movement. We organized “Clergy Lobby Days” in Tallahassee to urge passage of the Competitive Workforce Act for statewide non-discrimination protection of LGBTQ citizens. We made sure our legislators knew that we must treat others as we wish to be treated. In addition to our legislative efforts, we highlighted how communities of faith are evolving on LGBTQ protections, spoke out in support of banning conversion therapy and memorialized the two-year anniversary of the Pulse nightclub tragedy. Check out how one faith leader in Jacksonville was moved to support non-discrimination protections. We hosted interfaith trainings in Orlando and Jacksonville. Sharing a meal with people of various faiths, we learned how to identify dangerous speech that could lead to violence towards religious minorities and how to speak the language of peace to prevent or de-escalate violence. Over 75 faith leaders across traditions participated in the program. More convenings will follow in 2019. We built our online network of over 1,000 faith leaders across Florida and expanded our moral action ground game to include Gainesville. 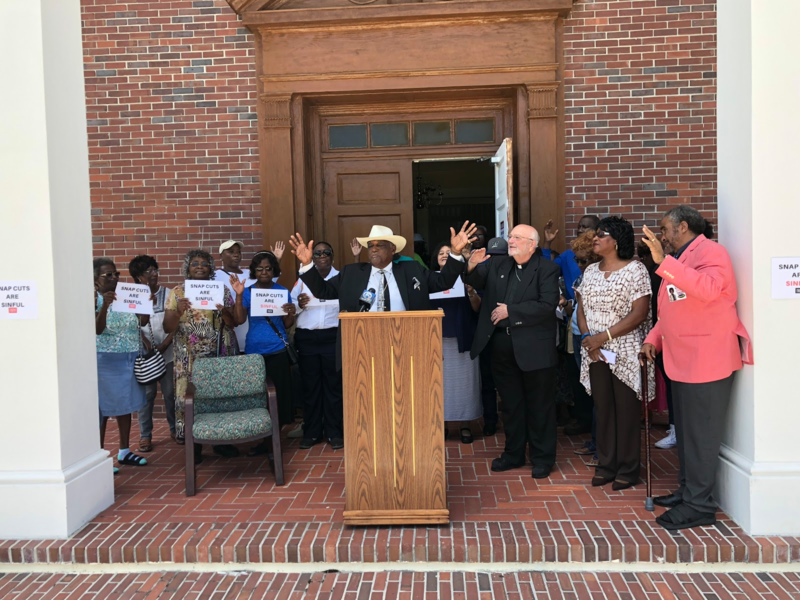 Our “rapid response” clergy teams were ready to respond publicly to local and national needs like when Congress threatened to cut SNAP food benefits to the working poor: we spoke prophetically in several cities, including Jacksonville, Orlando, Tallahassee and Ft. Pierce. Become a Faith In Public Life Florida donor by having you or your congregation/organization become a Movement Builder community. Together, we win. I look forward to a new year with you of faith in action.